St. Augustine, Florida, is where Florida Scarf was born. An event called “The Café 11 Trunk Show” was where I sold my first items in 2007. On November 16, 2010, I returned to the same people at the same show and had just as much fun as I’d ever had. It is the farthest I’ve ever traveled to do a show. I was most excited to use the company card for gas and food. Usually it only sees the light for internet purchases. I was in town for a total of 51 hours, and boy, did I make the most of it. In this post I plan to highlight the most awesome parts. There was a thrift store that was closing. Everything was 75% off. You couldn’t beat it! I have to thank my buddy Tara Ferreira for dragging me there and making this purchase possible. In case you are wondering, yes, it’s a sculpted beer-coozie. This next piece I purchased at the Trunk Show. It is by Paper Root, a local design company. Ever wonder what you get when you cross Willie Nelson with a Leopard? I have to really thank Paper Root for this gem of a t-shirt. It’s better if you give it as a gift. I also got an oversized owl ring. This look isn’t for everyone, but it suits me. The manufacturer has taken a symbol of ancient forestall wisdom and made it out of cheap metal and fake diamonds. Does it get anymore ridiculous? For this piece I apologize to anyone who prefers his or her owls made out of patchwork vintage fabric and sewn onto a journal cover. I also scored some killer pieces at an American Apparel Outlet Store. I’m psyched about them, but I don’t need to show you. We all know you shop at American Apparel when you need clothes to make you look like you just stepped off the set of FAME. Good Old Boxing Glove-Purse. I’ve missed you and your gold tooth. I apologize but I do not have any photos. If you are interested you might check a few spots. Thank you very much for reading this post. I trust it was more enjoyable than the last. 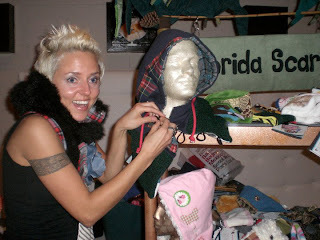 This entry was posted in Uncategorized and tagged 200 Lounge, business trip, classic blends, coozie, designer, fashion show, florida scarf, handmade, holiday shopping, one of a kind, sarah geraci, st. augustine, Trunk Show 2010.